The New Room has been named as the region’s best ‘Small Attraction,’ winning the gold award in the category of Small Attraction of the Year in record year for the Bristol, Bath and Somerset Tourism Awards Ceremony. The New Room also received the bronze award in the ‘International Visitor Experience’ category. Nearly 300 guests from the best tourism businesses across the Bristol, Bath and Somerset attended a black-tie dinner and awards ceremony in Bath on 15 November. The evening was hosted by Laura Rawlings, from BBC Radio Bristol, alongside Phil de Glanville, former Bath Rugby player, with sponsors presenting 86 hand crafted awards made by Shakspeare Glass. 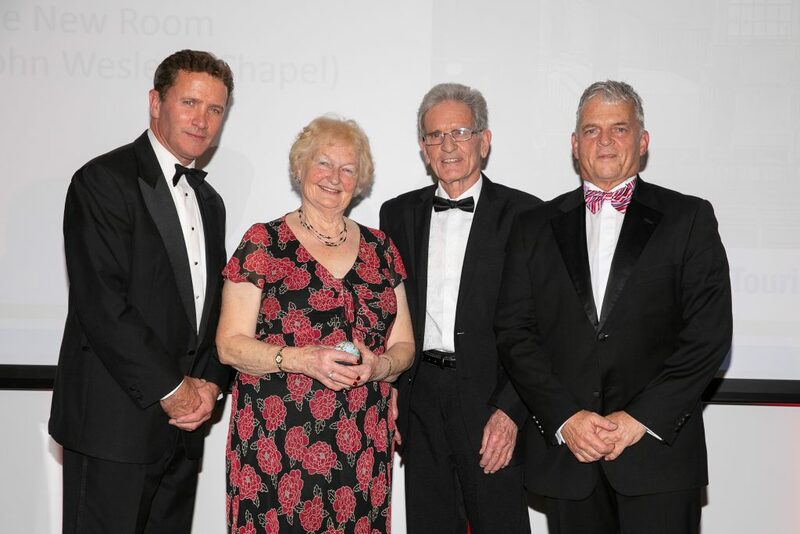 David Worthington, director of the New Room, said: “We are thrilled to receive these impartial accolades, and delighted with the recognition for our historic chapel and the new visitor centre and museum. The New Room’s multi-million pound visitor centre and museum was officially opened in July 2017, and was made possible courtesy of £2.6m from the National Lottery Fund and £1.4m from the Bristol Methodist District and other smaller trusts. Nigel Scott, Business Development Director at Bristol Airport, said: “This year’s Awards were a fantastic showcase for Bristol, Bath and Somerset. From small independents to major attractions, the range and quality of experiences on offer to visitors continues to impress.